Chong Kee Yong, one of the Malaysia's leading contemporary music composer, is one of the most exciting voices today. Few composers can manage to fashion a truly individual sound from the experimental techniques of today, and Chong belongs to this special class who can turn a melange of exquisite timbres into a compelling piece of music with his own fingerprints, music that composer Peter Eötvös describes as “imaginative and poetic” and composer Jonathan Harvey comment his music as “very inventive and artistically pure”. His style is highly experimental and innovative, yet deeply spiritual and lyrical in its own way. Chong’s musical language is enriched by his own Chinese, as well as the multicultural Malaysian, heritage; for example there are traces of Beijing Opera and Gamelan in Monodrama (2004) and hints of kabuki and Asian funeral rituals in his symphonic work Tearless Moon (2006). Chong was born in Kluang, Johor, where his parents were farmers. He graduated from the Malaysian Institute of Arts in Kuala Lumpur and completed his Bachelor of Arts at the Xian Conservatory with Prof Rao Yuyan and Prof Zhang Dalong. Professor Rao recommended that Chong pursue his final studies at the Royal Conservatory of Music of Brussels (Flemish & French sections) under the guidance of Prof Jan Van Landeghem and Prof Daniel Capelletti. There he acquired the tools for his compositional style today, which is a delightful balance between the most cutting edge modern techniques and a deep sense of poetic beauty. In 2001 Chong graduated as Master of Composition with Highest Honours. His post-graduation studies include numerous master classes with composers such as Brian Ferneyhough, Daan Manneke, Zoltan Janey, Peter Eötvös, Salvatore Sciarrino, Henri Pousseur, and Hanspeter Kyburz. He receives numerous commissions and grants, for example from Ensemble Prometheus (Belgium), Spiegel Quartet (Belgium), Transit New Music Festival (Belgium), Het Collectief ensemble (Belgium), Sprectra ensemble (Belgium), Spectra Ensemble (Belgium), Ensemble Modern (German), Akademie der Künste (Berlin), Herrenhaus Edenkoben (Germany), Malaysian Philharmonic Orchestra, Asian Cultural Council (New York), Viva 2007 Festival (Munich), Vlaaderen Symphonie Orkest (Belgium) the Serge Koussevitzky Music Foundation (USA) and the ministry of Culture, Arts & Heritage of Malaysia. 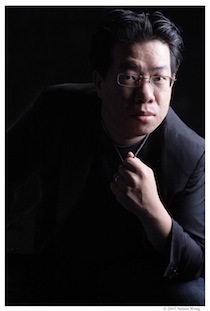 Chong has also worked with distinguished musicians such as Het Collectief Ensemble, Ensemble Prometheus, Ensemble Spectra, Quatour Danel in Belgium; Amsterdam Sinfonietta, Nieuw Ensemble in Holland; Kairos Quartett, Trio Jean Paul, Ensemble Aventure, Ensemble Mosaik, Ensemble Modern, Ensemble Integrale in Germany; Nouvel Ensemble Contemporain, Ensemble fur Neue Musik Zurich in Switzerland ; SORI ensemble in Korea and such orchestras like Malaysian Philharmonic Orchestra, Melbourne Symphony Orchestra, Vlaaderen Symphonie Orkest and Estonia National Symphony Orchestra. In 2006 Prof Peter Eötvös nominated Chong for a composer’s residency at the Herrenhaus Edenkoben Foundation, Germany from August - December 06. In 07 Chong has been invited by American composers Chou Wen Chung and Chinary Ung to present his music in a join concert in New York and his viola work was performed at the Asia Pacific Festival & Conference in Wellington, New Zealand. Most recently, he received a visiting artist fellowship to live in New York for 6 months (May-October 07) from the Asian Cultural Council (New York).